Raising children is difficult enough, especially when you’re committed to instilling Christian values in a world that seems increasingly less respectful of such views. Public schools are federally mandated to be free of religious instruction, and your children spend the majority of their days on school property. This can make teaching Christianity’s central tenets even more difficult, and is a leading reason why many Christian parents opt for a private, faith-based education over a public, secular one. They’ve Lost Faith in the Public Education System – Stories about overworked, under-appreciated teachers who have lost their fire for educating young people, and state mandated curricula that leave much to be desired are, sadly enough, not altogether uncommon. Private schools are known for focusing on their students with an emphasis on encouraging graduation and advancement to college. If you’re concerned that your child isn’t getting the one-on-one attention she needs in an over-crowded classroom, smaller classes focusing on Christ’s teachings as well as academic learning may be a better choice. They’re Impressed With the Results of Christian Schools – Some of the brightest minds in the world have had a private school education. Names you might recognize include Bill Gates, Barbara Bush, Princess Diana of Whales, John McCain, John Kerry and Tommy Lee Jones. While Christian schools are centered on the word of God, they also tend to be academically competitive in a way that many public schools are not. The Desire for Children to Receive a Faith-Centric Education – Sunday school is not always enough to deeply teach the Christian faith and all of its tenets. At a Christian school, religion classes are almost always a requirement and are taught every week, if not every day. Getting that extra dose of religion in their lives can help children learn more about their own faith while they’re learning academic subjects. To Encourage Kids to Become Stronger Christians – When religion is a part of your child’s daily life, their faith becomes stronger with every passing day. Questions they may have about Christianity or religion in general can be answered in a Christian school setting, and students are able to examine their faith in a tolerant environment. The constant reassurance of faith will help make them stronger Christians in every aspect of their lives. Having other children surrounding them who believe the same things will reaffirm faith, as well. To Help Kids Learn the Importance of Morality – Public schools aren’t really known for teaching morals, which is where Christian schools excel. Your moral values can be reinforced while your children are at school, rather than being challenged by a secular curriculum. They will better be able to make moral decisions after learning the standards of upstanding, moral behavior. Instilling Faith-Based Academic Teachings – If you want your child to know how their Christianity can affect all areas of their lives, Christian school is the way to go. 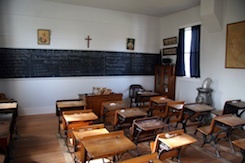 With certain private schools, all of the school subjects are taught with a Christian context. This is something you would never be able to find in a public school, which generally teach Creationism as a theory and evolution as a fact. Teaching Children to Be Respectful – The teachers in most Christian schools do more than teach just subject matter; they also teach respect. Simply learning more about Christianity will build a level of respect in your child they may never have reached were they left to their own devices in public school. Maintaining Discipline in the Classroom – Disciplinary systems within a public Christian school are typically much more strict than their public counterparts, with higher standards of conduct and classroom behavior. Parents looking for a less permissive environment may find that Christian school suits their needs perfectly. Finding Diversity Without Secularity – Though Christian schools do teach the Christian faith, there are still parents who will send their children to private Christian schools when they don’t share the faith. This is a great way to expose your children to the fact that the world is made up of all kinds of people, some of which believe different things, while still encouraging a foundation of Christian learning. Teaching a Biblical Approach to Human Existence and Purpose – It’s natural for people to question their existence, their purpose on Earth and the philosophical implications of being able to think on a higher cognitive level than any other animal. Christian schools will focus on answering these questions based on what’s taught in the Bible, again strengthening the faith of your child while teaching them more about their religion. Having a child is a lifetime commitment, and the values you teach them are the ones that they’ll carry throughout their own lives. Christian parents also know that their responsibility to their children extends beyond their physical bodies, also encompassing their immortal souls. In some situations, the best possible method of raising Christian children who cling to their faith is to enroll them in a school that reinforces those beliefs.